Quantum gravity is the holy grail for modern theoretical physicists – a single structure that brings together the two great theories of the 20th century: quantum mechanics and general relativity. As any theoretical physicist will tell you, quantum gravity is the biggest scientific problem of our age. The 20th century gave us two extraordinarily successful physical theories. One works astonishingly well at very small scales: this is quantum mechanics. The other explains how gravity works and can be used to describe the large-scale cosmos: this is general relativity. The big problem is that while both theories work extraordinarily well, they don’t work together. Quantum mechanics assumes an arena of space and time, as if everything were being played out against an invisible backdrop. General relativity dispenses with the backdrop: space and time are relative, and what we experience as gravity is the effect of matter moving in curved spacetime. Theorists in the 21st century seek to transcend quantum mechanics and general relativity, by developing a single, joined-up account that can explain the behaviour of the universe at quantum scales. They seek a theory of quantum gravity. There are two major approaches, seen as rivals though at root they have much in common. One has been widely popularized, and arises primarily from the viewpoint of particle physics: this is string theory. This book is about the other approach, less well known but gaining increasing interest and influence: this is Loop Quantum Gravity, or LQG. This theory starts from general relativity, borrows many ideas and techniques from quantum mechanics, and predicts that space itself is quantum in nature. Time emerges as an evolving sequence of jumps in the geometry of quantum space which form a ‘spinfoam’. 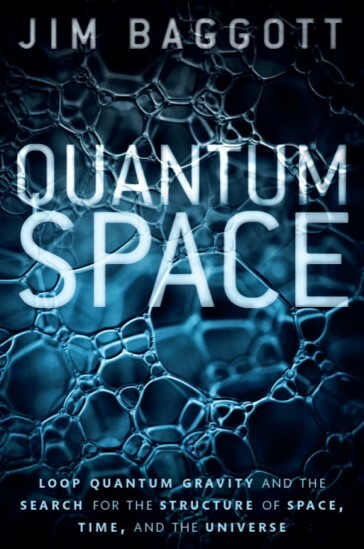 This is all very abstract, but Quantum Space offers an opportunity to glimpse, without any mathematical technicalities, the deepest, most fundamental contemporary ideas concerning space, time, and the universe. Lee Smolin and Carlo Rovelli have been leading players in the development of LQG, and Jim Baggott frames the story around the work and life experiences of these two famous physicists: their hopes, their frustrations, and their moments of triumph. They are also close friends, whose collaboration spans 30 years. This is also their story.